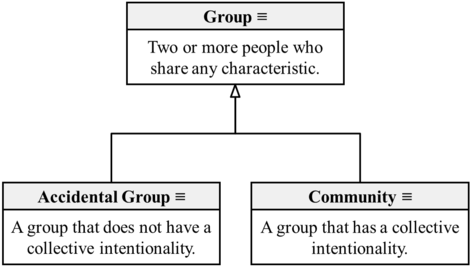 Accept a new taxonomy for group and its two sub-types - accidental group, and community. The modification was suggested to Scientonomy community by Nicholas Overgaard on 19 May 2017.1 The modification was accepted on 2 February 2018. Although it is accept in scientonomy that communities are bearers of mosaics, the notion of community currently lacks a proper definition. To remedy the situation, I suggest differentiating between accidental group and community as two different types of group based on the respective absence and presence of a collective intentionality. This differentiation provides a foundation for the taxonomy of social agents of scientific change. Group (Overgaard-2017): Two or more people who share any characteristic. Accidental Group (Overgaard-2017): A group that does not have a collective intentionality. Community (Overgaard-2017): A group that has a collective intentionality. This page was last modified on 2 February 2018, at 15:45.